With the expansion of technology, The Desire to have more TV's through out your house attached to your cable line grows. But one thing people don’t understand is that every time you put a splitter in to connect 2 TV's to one cable line, you loose more signal. I will give you the knowledge that I learned of the past 2 months about how splitters work, how signal degrades, and what levels are the perfect combination. First let’s start off with the signal strength levels. The Ideal signal is at 0db (zero decibels). 0db is the strength of the signal coming from the cable box on the street into your home. For every Splitter put in the line, you loose either -3.5db or -7db depending on the splitter. Your Digital cable box and your Cable modem have limits to how low it can go before you start loosing your service. The Ideal range is the range of db that your box will still work with no issues. 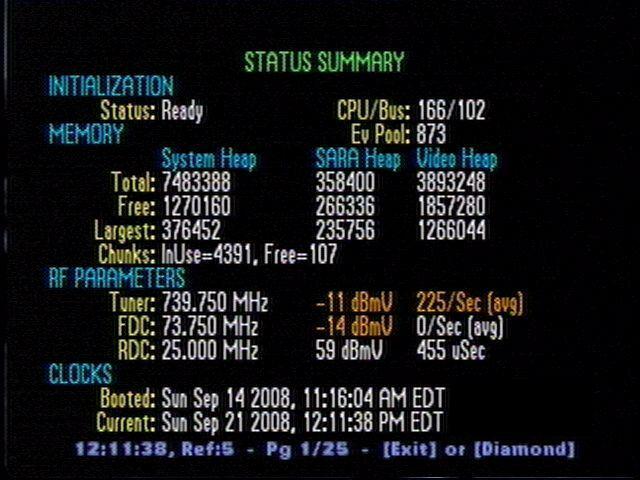 The closer to the limit, you will begin to experience video lag, pixilation, or intermittent service loss. Anywhere out side the Limit will result in complete signal loss. 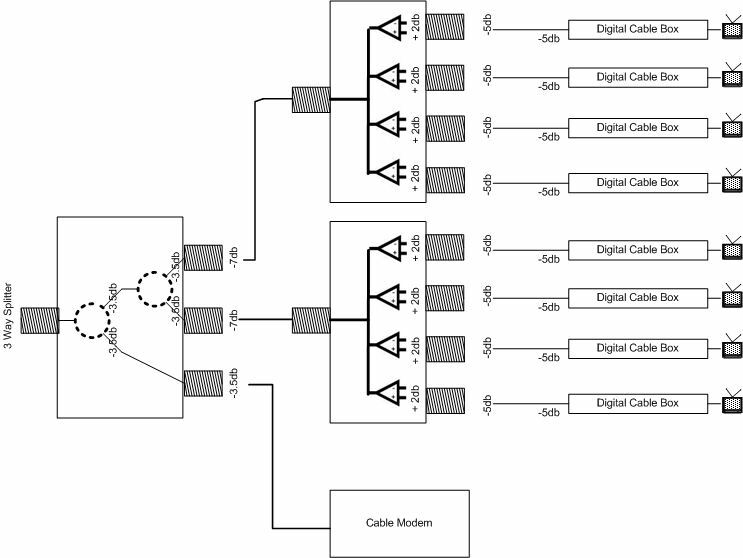 Digital Cable boxes have both analog and Digital signals. Analog channels 01 thu 99 are analog, and with drop in db levels, will just cause the video to loose quality. The Digital channels 101 thru 999 will pixilated or 'freeze' while watching. How do I know what my levels are? Turn your Digital Cable box and TV that is attached to it on. Tune to a Digital channel (101 thru 999) We will use channel 121 DIY channel. Step 3: Push the 'INFO' button. 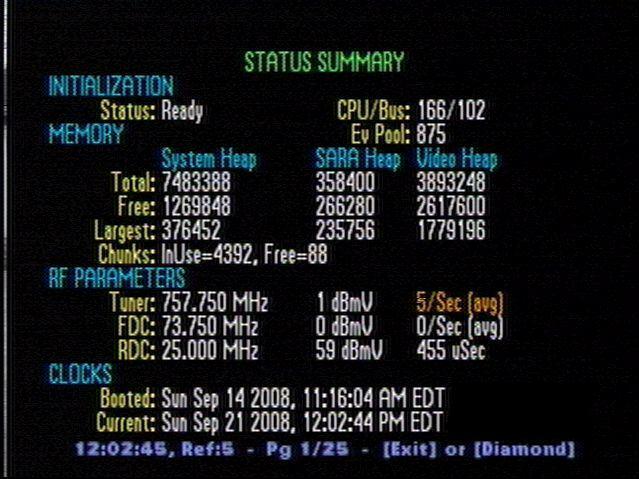 Look down under RF Parameters, for 'Tuner' This is listing the frequency for the current station, And in the second column is the db value. In this case, it is currently +1dbmV. Which is +1db higher. Which is just fine. Step 1: open up a web browser of your choosing. On this one, the level is at -2.9db. Also well in the preferred range. So what does all this mean? And how did my signal level drop so far? First, how do they work? They take the input signal and divide it up in to two or more outputs. In the process, loosing -3.5db of signal strength each time. Just like if you had a garden hose, and put a two way attachment on to the end of the hose. The water pressure you normally get out of one has been split into two. Which results in lower pressure. Same applies to cable signal, only its more consistent. 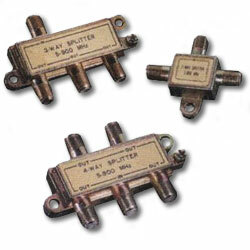 It doesn't matter if the signal is split in the same splitter, or among different splitters. For every split, you will lose -3.5db every split. Easy, don't use as many TV's. :). I know you want to have 20 TV’s all around the house including the bathroom. So how do you fix some of this? Get a powered coax amplifier. You can find these at Radio Shack, Home Depot or Lowes in the Cable/Network/Phone department. These are good to amplify the signal by an average of +2db to +3db. I would recommend getting a 4 way even if you don't have 4 TV's. This will give you room for expansion should you decide to want to watch the game in the garage 6 months down the line. Note: They do require a near by outlet to plug into for power. IMPORTANT: Don't connect your cable modem to a Coax Amplifier. 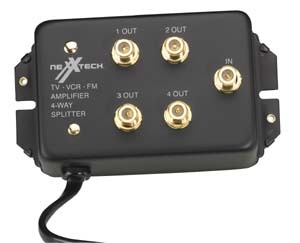 A Coax Amplifier is only made to carry Digital and Analog TV signals. And wont carry cable Modem information. Thus your modem will just sit there forever blinking because it can't connect. How do I connect my cable modem to all this? With the original line coming into the house. Out of the First splitter from the main line, Always have a dedicated line running strait to the Cable modem. Only use a 2 or 3 way splitter on the main line. 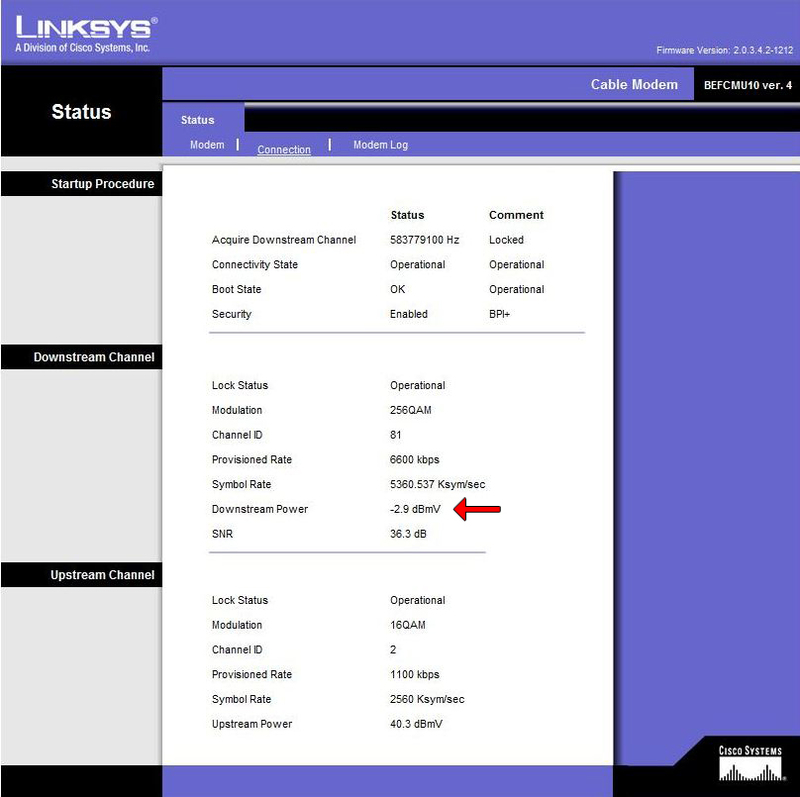 And always connect the Cable Modem line to the output that is -3.5db. This way you can have the maximum signal strength possible to the Modem. Then use the other output to the Coax Amp for the remainder of the house. Results may vary. In my case, I have it setup like the above 3way splitter with 8tv's. and get +1db at the Digital Cable box. So the Coax Amp is bumping it up more than +2db. No I have not tried Connecting one Coax amplifier to another Coax Amplifier to amplify the signal again. I don’t really see any reason why you should need to. But let me know if you get a result from it.